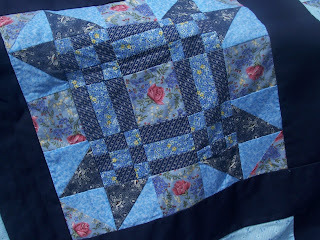 I took my first quilting class in 2002. I was newly married and had my first job as a recreation therapist in an assisted living facility. I really wanted to get the "little old ladies" there in a quilting group or something, but I had no skills. 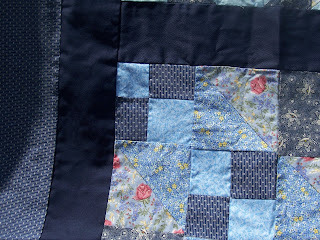 My mama taught me to sew at eight years old, but I had never done anything like a quilt. 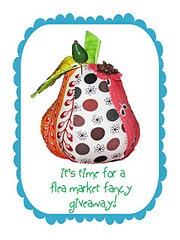 So I signed up for the sampler quilt class and a few months later, here it was. Pretty sure it's not supposed to look like this! That top left rectangle should probably be a square. I have definetly learned to slow down and do each part of the process correctly - measuring, cutting, sewing 1/4", etc. Notice I did not say 'perfectly', just correctly. There's a big difference. Back then I was just doing it to get through each block, be done with it, and get to the next one. I have really learned to slow down and enjoy the long process that it can be. So like yeah... Most seams aren't matching up on this block because I was hasty in my ways. Don't I sound like a 90-year-old? ;) But seriously, I was pretty much slapping squares together faster than I should have, especially for a newbie. I believe this was the last block in the class sequence and I must say that it doesn't look too horrible. Those were some tiny squares going on there. I never got around to backing, binding, and quilting it. Actually those key things weren't discussed in my class, so I just kinda folded it up and put it on a shelf. It is now on the ever increasing list of things to do... finish the first quilt. One of the most obvious things I have learned was fabric selection. The value and color make all the difference. I knew I liked the color blue, and I was supposed to select a certain amount of fabrics, but never took into consideration the scale of the print, the value of the hues, and how they coordinated. I pretty much went to Joann one night and bought the first 7 blue fabrics I saw. Now fabric choices consume my life, but that's another story! I'm still all about blue, but taking my time and being more thoughtful and purposeful about things as well. And I also made a couple kids to put on the quilts which make them look even better! 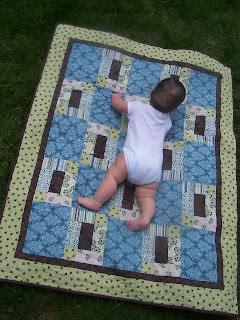 Fantastic first and the newest (quilt and baby) are very cute. I love the poka-dots! You are doing a great job. I love your latest quilt! It's beautiful. And thanks for the reminder to slow down and do things correctly. That's an easy thing to forget, but it's a big one! 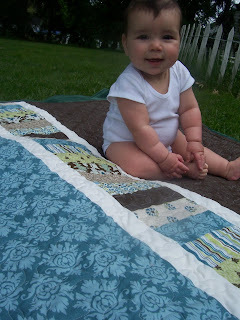 your latest quilt is so pretty, i love the colors and your little model is adorable. I really like your first quilt. Your latest on is really nice, too. Have a great day. Both of your quilts are wonderful. And the kid you made is even better! 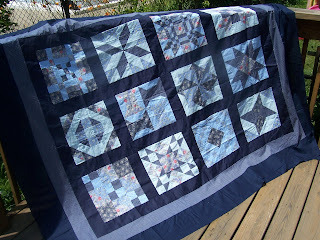 I love the fabric in your recent quilt!! 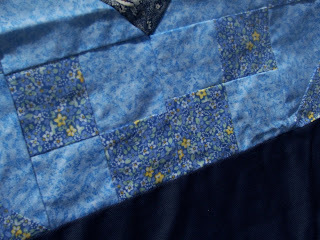 Blue and brown is one of my favorite combos but I've never used them in a quilt before. Might have to give it a go. Your quilts are great! Color and value are one of the hardest things to get right. You really got it with your second quilt. Awesome!